A special Black History Month presentation of The SHAOLIN JAZZ project and lecture series 2/25/16 VCDMA , Bowie State University. 6-7 PM. Recital Hall, Fine and Performing Arts Center (FPAC). FREE!! Teo Melchishua, filmmaker, animator, professor and program coordinator of the Visual Communication and Digital Media Arts program (VCDMA), Dept. of Fine and Performing Arts at Bowie State University, will moderate a panel discussion on with Hollywood film director, Jamal Hill at 7:30 p.m. Thursday, February 25, in the Recital Hall of the newly designed Fine and Performing Arts Center (FPAC). Jamal Hill is an NAACP Image Award nominated director, writer and producer. He has directed films "Brotherly Love" starring Keke Palmer and "Deuces" starring Meagan Good, Larenz Tate and Lance Gross and will be released in 2017. He has worked with Queen Latifah's Flavor Unit production company among other Hollywood film. The discussion will focus on breaking into the film industry, director's life, casting, book to movie productions and more coming into their own as directors, book publishers and producers and what lies ahead for them. The panel, which is free and open to the public, will include Jamal Hill, Hollywood film director and founder of the Philvison Entertainment and NAACP Image Award nominee. 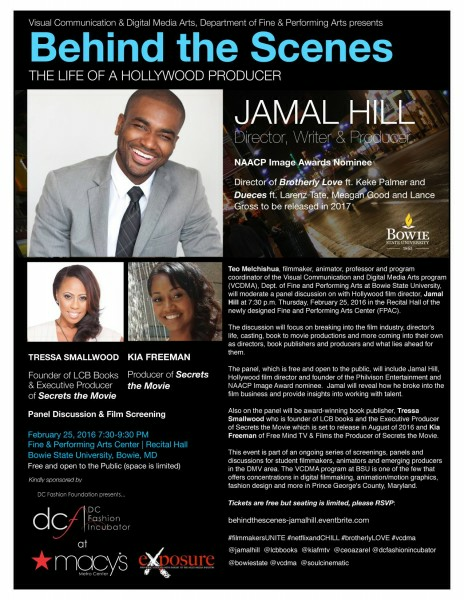 Jamal will reveal how he broke into the film business and provide insights into working with talent. Also on the panel will be Award Winning book publisher, Tressa Smallwood who is founder of LCB books and the Executive Producer of Secrets the Movie which is set to release in August of 2016 and Kia Freeman of Free Mind TV & Films the Producer of Secrets the Movie. Just Announced! Hip-Hop and Visual Culture minor, Visual Communication & Digital Media Arts (VCDMA). Starting in Fall 2016, the Department of Fine and Performing Arts, College of Arts & Sciences through the Visual Communication & Digital Media Arts (VCDMA) program will offer an interdisciplinary minor in Hip-Hop Studies and Visual Culture (HHVC).